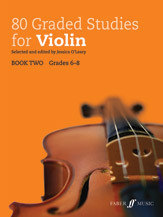 80 Graded Studies for Violin, Book 2 is a must-have resource for teachers and students. Studies are an established part of every instrumentalist's training. They place technical problems in musical contexts, and can be invaluable aids for development. This study book brings together a broad selection of repertoire including works by famous pedagogues such as Kreutzer, Mazas, and Sevcik, as well as folk songs, lesser-known gems, and contemporary studies. The studies in Book 2 are arranged in order of increasing difficulty, according to a carefully planned technical progression from Grades 6--8.